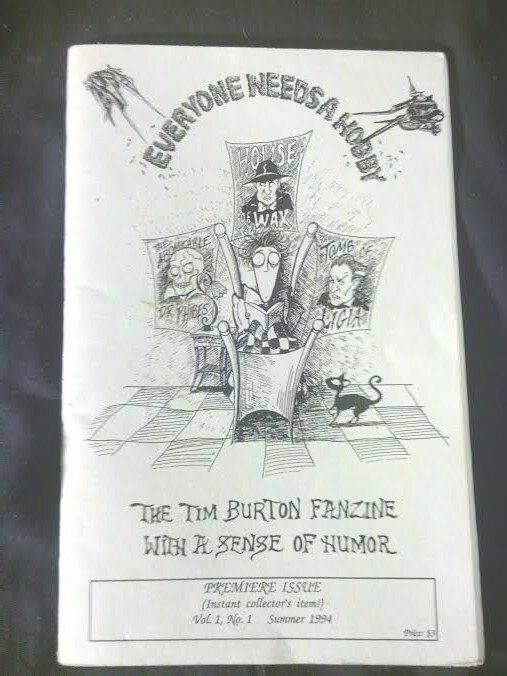 The premier issue of EVERYONE NEEDS A HOBBY: THE TIM BURTON FANZINE WITH A SENSE OF HUMOR. I’m going to be honest with you. I have three issues of this and I don’t have the first clue where I got any of them. Much of the ’90’s for me is a blur of high school angst, flannel, and Friends reruns. But somewhere in there, I found this fanzine. 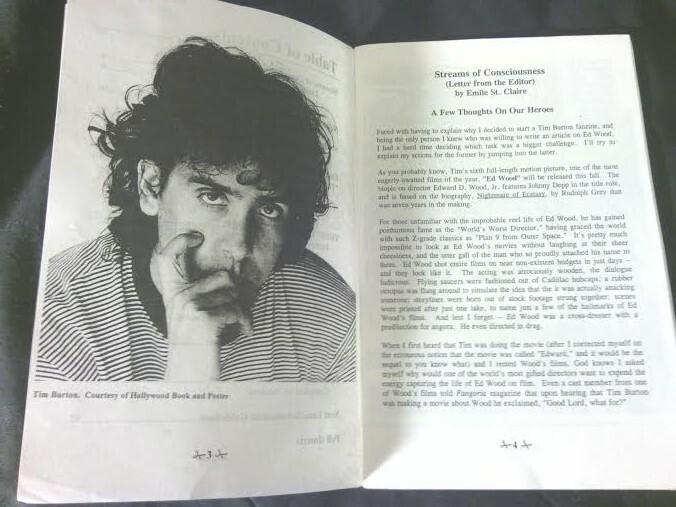 Believe me, the irony that I’m writing about a proper fanzine in a medium that pretty much killed the fanzine is not lost on me, but here we are. Where I was when this thing came out was in high school in a small town, with a bedroom full of Cure CD’s, a Batman obsession, and hard-on for Lydia Deetz. Let’s turn some pages. I’m not going to go into all of it, but I think we’ll hit some fun highlights. First off is a picture of the guy himself and a brief introduction. Despite the long, stringy mess of blonde hair I had in high school, you guys have no idea how hard I tried to rock this look. It didn’t work out. I was a lot more Kurt Cobain than Robert Smith. Further in, we’ve got the “News and Sightings” section, where we find out the latest in Burton news. It goes for 4 pages and has some interesting tidbits. There is one particular paragraph that goes into the fact that Batman Forever is now filming! And MICHAEL KEATON WON’T BE BATMAN. Whaaaaaaat? That was something, right?…. No. That was not something. What that was, was one of only two times in which I nearly got up and walked out of a theater before the movie was over. The second one, by the way, was Batman and Robin. Which brings us to my favorite part of this issue. 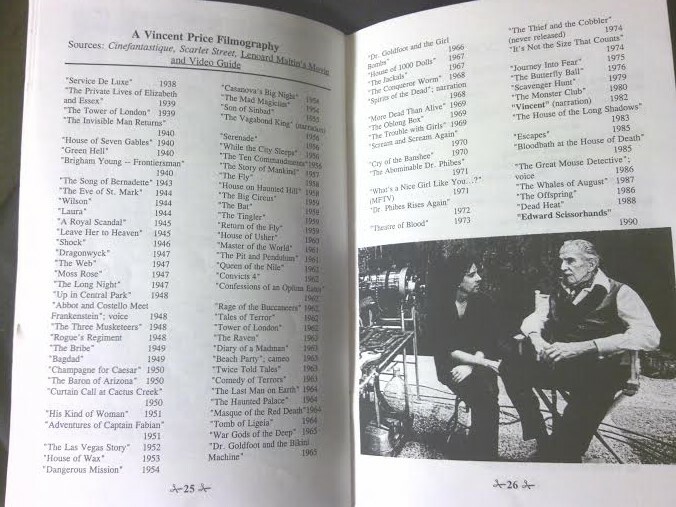 The Vincent Price Filmography! This was an incredible resource for Teenage Horror Nerd Me back in the days when the internet was taking its first baby steps. You kids have no idea how easy you have it. Not kidding. That’s what it’s called. Oh come on. Like the Tim Burton zine that was published in the mid-90’s, geared toward mopey teenage goths, wasn’t going to have a damn poetry section. It seems a few folks were dying to read the literary tour de force that is “Body Piercings, Hairdye, Scars, and Speed”. Well, never let it be said that I don’t deliver. Hey, folks. Just wanted to pop in and let you know that I shot some great content this weekend for the site and the first proper post will be coming very soon. It’s going to be a collaborative effort with another stellar site that some of you already know and love. I’m incredibly jazzed about what I have planned for all of us. I also wanted to give a big thanks to my buddy Ipsy for contributing the new banner up top as a “house warming” present. Well, here we go. Your obligatory introduction post. Welcome to my new venture in horror love and discussion. I won’t stick to strictly the spooky stuff, but nearly everything covered here will have a dark bent of some kind or another. 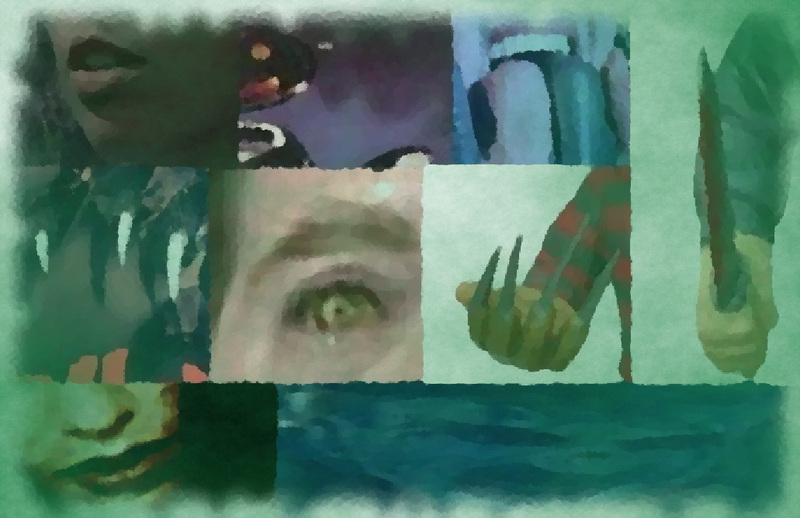 If you’ve managed to find this, I’m not going to bore you with too many details…yet. My name is David (aka DJ D) and I host Dark Entries: Goth Radio on WUSC 90.5 FM. I love cold weather, Batman, and Hellraiser. I really love Hellraiser.